There was a time about 10 years ago when miniature fountains were a popular trend. Some had small plants. Some had ceramic sculptures. All had small stones, pebbles or marbles. The sound of trickling water could be most relaxing. But the trend only lasted a couple of years, although remnants of the fad may still be found here and there. Today, a new, relaxing trend has grown and is alive and well at the Scripps Ranch Farmer’s Market in the form of miniature Zen gardens. Hideko Edwards recently began her business named HD Creations, featuring the small Zen gardens, kokedama moss balls and colorful orchids. While this is only the second week of business for HD Creations, moss art is booming in Japan, said Edwards, who is a native of that very country. She and her daughter, Donna McClelland, were staffing the HD Creations booth last Saturday at the Scripps Ranch Farmer’s Market. Both are very knowledgeable about the creations and plants they sell. 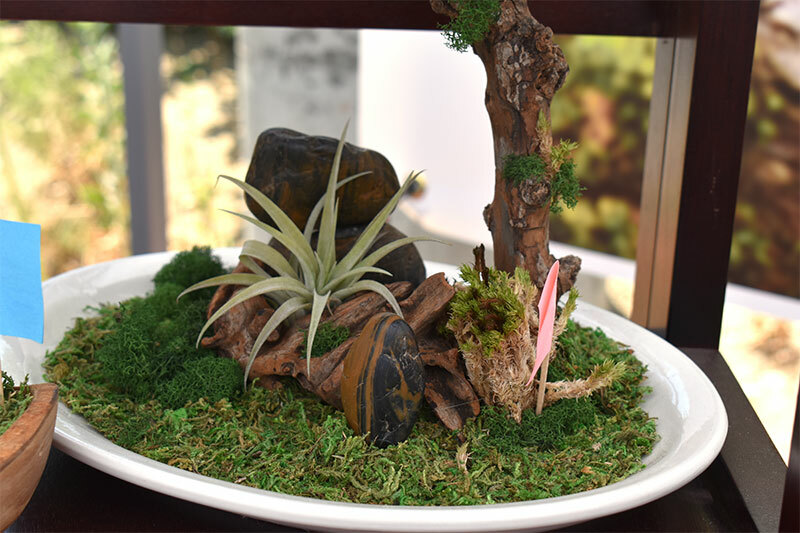 Mini Zen gardens are arranged on a base with preserved moss in various hues placed around, highlighted by at least one air plant. “We really enjoy making this art. It’s Zen gardens, moss-based, with actual (living) plants,” Edwards said. Each miniature Zen garden is arranged on a base that looks about the size of a large saucer or small plate. Preserved moss in various hues is placed artfully around the base, highlighted by at least one air plant, resembling a succulent. Stones or small ceramic figures or structures complete each garden. Anyone who appreciates miniatures or perhaps bonsai trees would most certainly enjoy these Zen gardens. Some of the gardens have a pattern of crystal sand glued down in an intricate pattern, with the moss arranged nearby and an air plant providing the main focus. Air plants actually have roots, but they don’t need to grow in soil, McClelland explained. They still need water. The entire plant can be soaked in room temperature water for about 20 minutes. The water can be shaken off and the plant can then be placed back in the Zen garden. “We wanted to have some live plants in this, so we put in the air plants because we wanted it to stay light,” Edwards said. HD Creations offers kokedama, a ball of soil covered in moss from which a small plant grows. 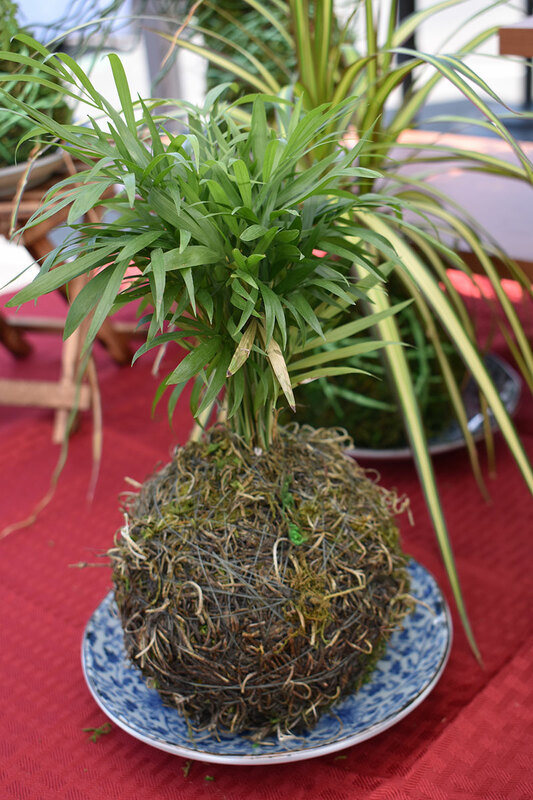 Another intriguing item for sale at the HD Creations booth is kokedama, a ball of soil covered in moss from which a small plant grows. These creations were peacefully displayed sitting on a table, but they can easily be hung just about anywhere as living ornaments. As delicate as they seem, the are not difficult to care for. 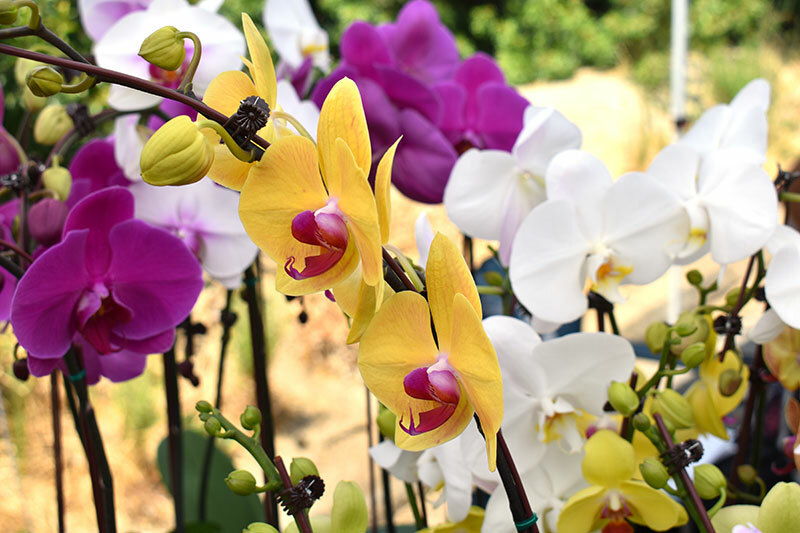 The items that stand out the most and greet customers at the booth are the colorful orchids standing tall from a table. These also have a small base of roots. 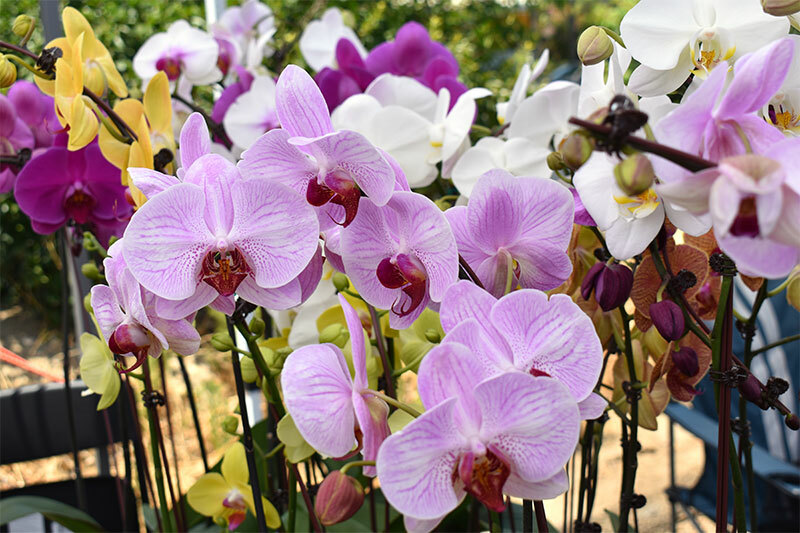 Orchids are also surprisingly easy to maintain, but it’s important to remember these plants are like people: they thrive in the same comfortable climate a human enjoys. When the roots begin to turn a silvery color, that’s the time to water them. It’s fine to submerge the roots in some water, but don’t get water on the leaves because water rots the leaves and damages the plant. Edwards retired from the restaurant industry and took up the moss-based arts as a hobby when she became bored. She said she eventually thought it would be a good idea to try to sell some of her creations. The mini Zen gardens sell for $15 to $30. The orchids are $16 to $25. The kokedama moss balls cost $10 to $20. 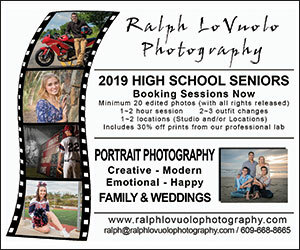 Contact HD Creations by email at hdcreations77@gmail.com. 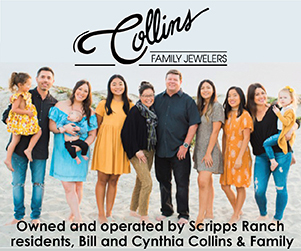 Find the HD Creations booth at the Scripps Ranch Farmer's Market, which is open for shoppers from 9:30 a.m. to 2 p.m. every single Saturday at 10380 Spring Canyon Road, in the Innovations Academy parking lot. Visit srfm.org.